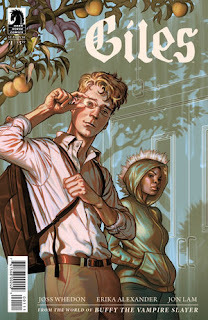 The Fellowship was fortunate enough to obtain a copy of GILES SEASON 11 #1 from Dark Horse Comics. Joss Whedon and Erika Alexander write, Jon Lam draws, Dan Jackson colors, and Comicraft letters. Giles is back from the dead, but as a teenager. Buffy and her crew have been “detained,” so Giles is laying low. Unfortunately for him, that means enrolling in high school. Fortunately for him, the high school he’s attending is chock full of magical weirdness, including some sort of monster in the basement and a cute girl who’s not all she seems. High school is certainly not going to be boring this time around. Another downside for Giles is that laying low means avoiding the use of magic, especially as it doesn’t take him long to get into trouble. He’s smart and resourceful, of course, but this is a prep school, so everyone else is too. The story has a lot of interesting bits packed into this first issue, and the art is top-notch, handling the action especially well. Giles has been one of my favorite characters since the beginning of the TV show, so picking this up was easy for me. Its quick pace and witty narration makes it very accessible to all, though, so go check it out. GILES SEASON 11 #1 is available now from your local comic shop, or online at darkhorse.com.